All season long, the Miami Heat have celebrated Dwyane Wade’s career. It all led up to Tuesday’s home finale, which was Wade’s final game in Miami that saw them eliminated from the playoffs despite a 122-99 win over the Philadelphia 76ers. The Heat did not miss the opportunity to pay tribute to the three-time champion and future Hall of Famer. The team kicked off the home finale against the Philadelphia 76ers with a tribute video recreating an iconic Wade commercial featuring his son Zaire, who met his dad on the court. Wade went on to give love and thanks to his fans and teammates for the ride that has been his final NBA season. Wade also received a video tribute from former President Barack Obama, a noted basketball fan. After the lights went back up and the ball was tipped, Wade scored the first bucket of the game. It was the first of several for Wade, who led Miami with 30 points in the Heat win. 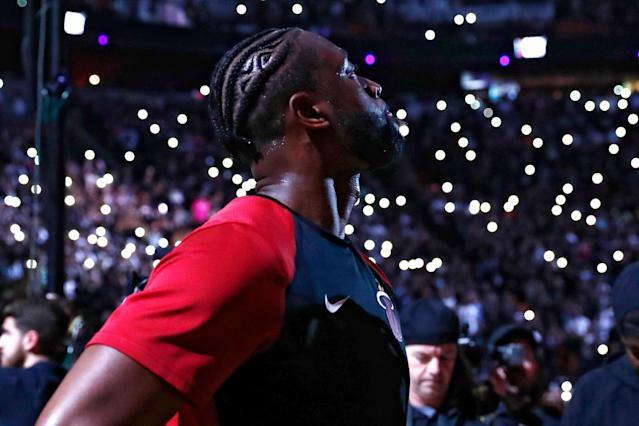 Miami fans took the final opportunity at home with Wade to let him know what they thought of former Boston Celtics forward Paul Pierce, who recently claimed to have had a better career than his Heat rival. As the fourth quarter wound down, Wade checked out for the last time at home to a standing ovation with a win in hand. After the game, Wade did a jersey swap with all of his teammates. He saved his last home game-worn jersey to swap with 76ers forward Jimmy Butler. He addressed the home crowd one last time in a moment that wasn’t ideal, but was certainly memorable as he didn’t quite stick the landing on one last table jump.